Zadok progressive grunge-folk notation. | Zadok: Progressive Grunge-Folk. Posts tagged Zadok progressive grunge-folk notation. A present for Jazz rocker Sebastian. 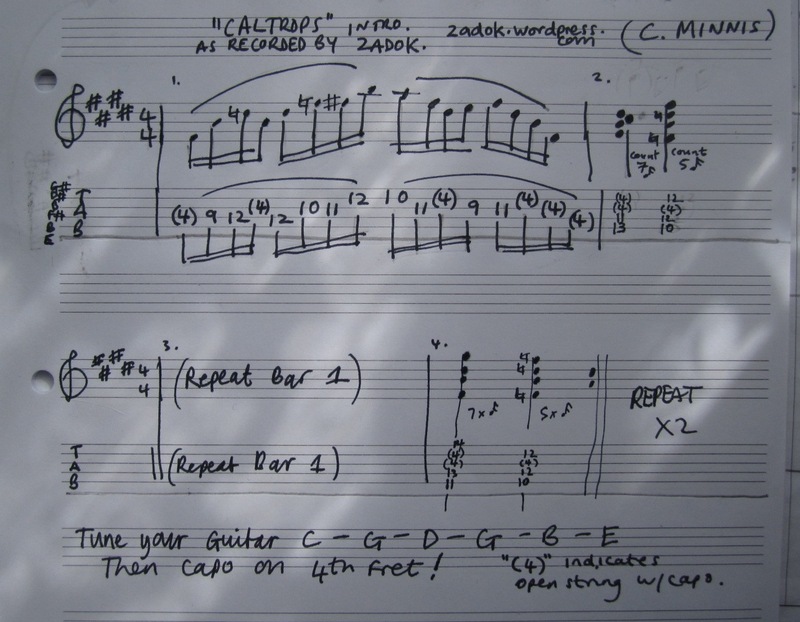 June 24, 2012 · Filed under Zadok	· Tagged caltrops tablature, Zadok progressive grunge-folk notation. A fellow from Chile asked us for a score for the intro to Caltrops. Here it is, Sebastian. CGDGBE, then capo 4th fret. You can pick all the notes but better to find a nice flowing hammer-on/pull off pattern. I do it slightly different every time but these are the notes. Thanks for your interest in Zadok TM.